The Asian giant hornet inhabits some of the best travel destinations in Asia, which is terrifying if you happen to suffer from apiphobia (fear of bees). 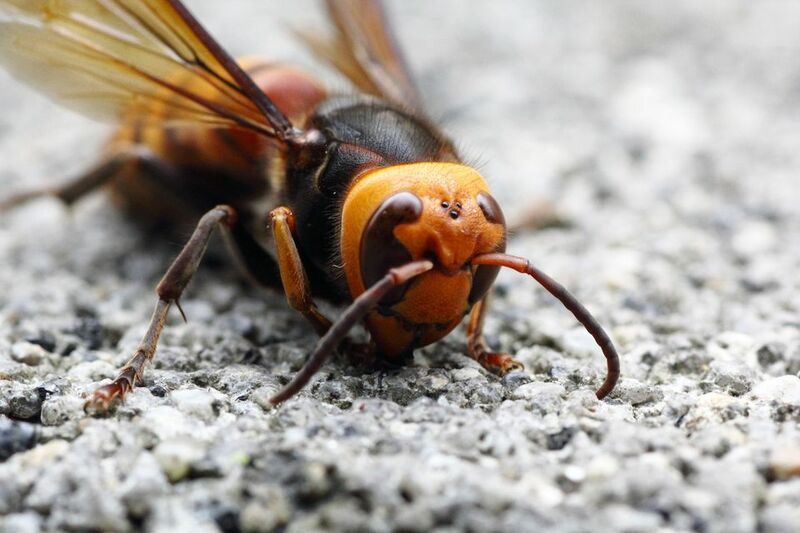 Even if bees don't scare you, you'll probably be re-thinking your position if you happen to look at a photo of what happens to human skin after Asian giant hornet stings! Even further investigation into the nature of these Asian killer bees, not to mention their behavior and potentially lethal capability, will make you positively petrified. If you're still not afraid of bees, that's probably going to change after reading this article. What is the Asian Giant Hornet? Although people unlucky enough to live where it resides have long feared it, the Asian Giant Hornet made international headlines in 2013, when a swarm of them killed 42 people in rural southwestern China. Those lucky enough to survive the Asian giant hornet stings were left not only with wounds resembling bullet holes, but with kidney damage, which in some of the cases will last a lifetime. Part of the reason the Asian giant hornet is so deadly, even if you don't encounter a swarm of them, is that it doesn't die when it stings you. In fact, these hornets don't even lose their stingers, are most other bee and wasps species do, so they can sting you multiple times if they're especially agitated. And they usually are! Where Does the Asian Giant Hornet Live? Known scientifically as Vespa mandarina (that sounds lovely, doesn't it? ), the Asian giant hornet can be found all over Asia, from Taiwan, to mainland China, to Southeast Asia and west into India, Nepal and Sri Lanka. It's most common, however, in the mountains of Japan. If, for example, you're hiking the country's historical Nakasendo trail, you could have several close calls with the hornets. If you're lucky, they won't attack you; you might even be more afraid of bears, given the threat of bear encounters in those woods. The bad news is that in the future, you probably won't have to travel to Asia to encounter the Asian giant hornet. Many scientists believe that the spread of Asian giant hornet stings over the years has been due to climate change, from regional droughts to rising temperatures across the board. Milder winters results in fewer of the creatures dying each year, and scarcity of water and other resources make them even more hostile than they would usually be. How Can Travelers Protect Themselves from the Asian Giant Hornet? To be sure, although most wilderness creatures run (or fly, as it were) in fear upon hearing the stomping of a human or similarly large mammal, Asian giant hornets hear our steps as a call to arms, which says nothing of their attraction to our sweat, the sweet substances we consume and even some of the colors we wear. The good news is that authorities in certain countries are attempting to destroy Asian giant hornet nests, which resemble large basketballs dangling from trees, cliff faces and other high places. The bad news is that doing so is dangerous and, thus far, only minimally effective, especially given the aforementioned spread of the species due to climate change. If you travel in Asia and you see one of two of these creatures, stay calm and don't panic. If you hear loud buzzing and notice a swarm, however, you should really run for cover as fast as possible. Regardless of which action you take or what fate befalls you, don't say I didn't warn you! Is It Safe to Travel During Southeast Asia's Monsoon Season?